You guys know I get crazy busy around this time of year, with all the costume orders. 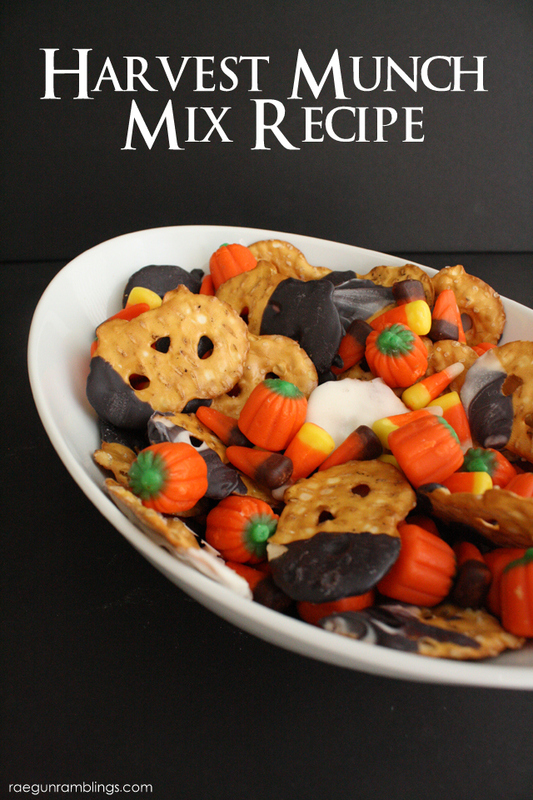 In order to keep from missing out on the fun I’ve had to make some good quick recipes and today’s Harvest Munch Mix is perfect for throwing together when you want a quick yummy snack. I’ve had it sitting out the last week and my family has been picking away at it as they come to help me sew, hold the baby or just make sure we’re surviving the costume chaos. It’s SO easy to make your own. You can make Marble Chocolate Dipped Pretzels or just do regular dipped ones to save time. My nieces LOVED helping me dip the pretzels. After you let them dry then all you have to do is mix them with a bag of Harvest candy corn, you know the kind with the pumpkins and you’re good to go! 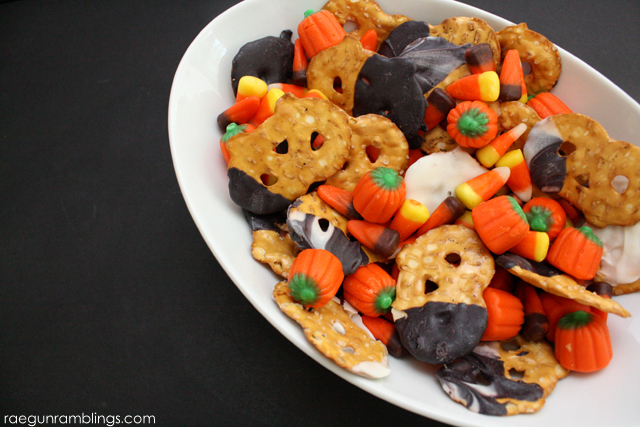 I like to think the ones with black candy melts are little bats and the white ones are ghosts but this would be great for Thanksgiving too you could use browns and oranges instead of blacks and whites! You could even throw in some other treats or maybe nuts to make it all your own. I told you easy! mmm. we love those pretzel crisps, and dipping in chocolate make them even more fun. I’d have to make it alone though, my son would eat them all before we could make the mix.